Prototype: German Federal Railroad (DB) class 491 "Glass Train" electric powered observation car. Cream white / gentian blue paint scheme. The car has double lamps low on the ends. Air intake openings for ventilation and horns on the roof. 1 double-arm pantograph and 1 single-arm pantograph, each with double contact strips. Powered rail car road number 491 001-4. The car looks as it did around 1986. Model: The car has an mfx+ digital decoder and extensive sound functions. A welcoming announcement from the period as well as a list of destinations, an additional note for the passengers, and the end station (train announcement) can be activated by means of the function buttons. The car also has controlled high-efficiency propulsion. 2 axles in one truck powered. Traction tires. The car has built-in interior details. The car comes from the factory with a driver and numerous passengers. The car has factory-installed interior lighting. The triple headlights and dual red marker lights change over with the direction of travel, will work in conventional operation, and can be controlled digitally. Maintenance-free, warm white and red LEDs are used for the lighting. The interior lighting can be dimmed as a digital auxiliary function. The trucks have different wheelbases like the prototype. The panorama windows are inset. The car has air intakes for ventilation and horns on the roof. 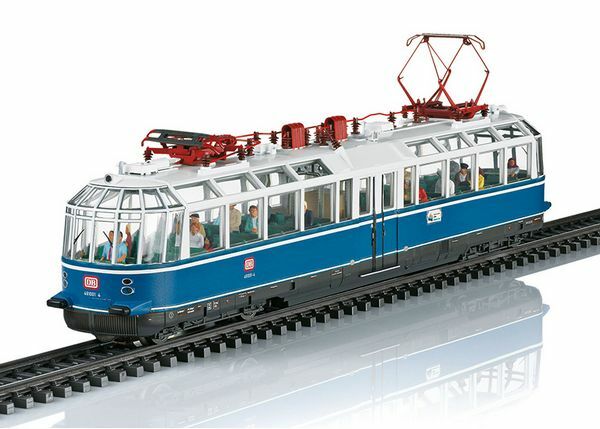 This car is the version with 1 double-arm pantograph and 1 single-arm pantograph, each with double contact strips. Length over the buffers 23.7 cm / 9-5/16". mfx+ digital decoder included, for even more operating enjoyment in the Marklin "World of Operation". Imprinted train route sign included, "Reisen und Schauen mit dem Glasernen Zug" / "Travel and Look with the Glass Train". This model can be found in a DC version in the Trix H0 assortment under item number 22193.